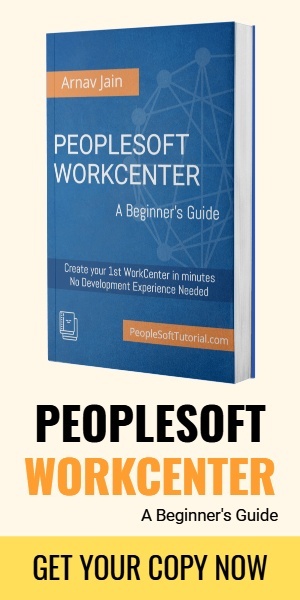 The best feature of PeopleTools 8.54 is Fluid Interface and you have decided to use it for your PeopleSoft application. You have spent hours and days creating lots of Fluid pages and now trying to access it from your desktop browser. But you don’t see Fluid features in your application. What’s the cause? Below post discusses one of the probable reasons for the issue. It’s assumed that you have already enabled Fluid interface for your PeopleSoft application and only few users using Internet Explorer are facing the issue and their home page is similar to what is shown below. You don’t see the notification and navbar here in Internet Explorer where as it’s visible in other browsers. This problem is common to users using Internet Explorer 9/10 and trying to access Fluid interface features. 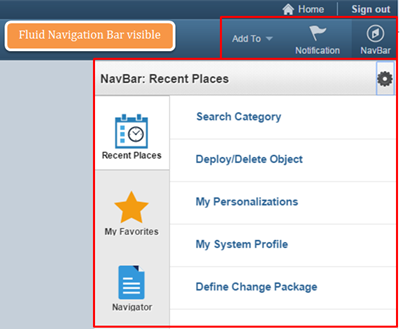 Below is the example of how Fluid Navigation Bar should appear inside a PeopleSoft application. You should see Notification & NavBar as shown below. Your first thought might be that if it’s appearing in one browser (e.g. Chrome) but not in IE, then reason must be that browser isn’t supported for PeopleTools8.54. Upon checking the browser certification for PeopleTools 8.54, you would notice that Internet Explorer version 9/10/11 are supported. But when you try to access fluid interface which is a feature delivered with PeopleTools 8.54, you won’t see the Notification or NavBar. 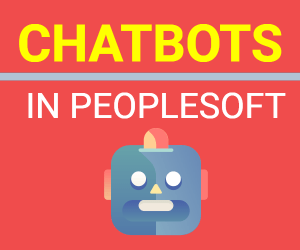 The reason for this issue is that though IE 9/10/11 are certified to work with PeopleTools 8.54, they are not compatible for Fluid and Mobile Application Platform (MAP) features. If you check the product certification details for these browser version, you would notice that it’s clearly mentioned that Internet Explorer 11 is the minimum version required for Fluid and MAP features. Minimum Browser Version supported for Fluid User Interface are mentioned below. For PC- IE 11, Firefox 24 and Chrome 35 are supported for Fluid interface whereas For mobile – IE 11 for Windows 8.1(tablets only, not smartphones) , Safari on iOS7 and Chrome on Android 4.4 are supported. Make sure you are using supported browser before you try to access Fluid Interface features in your PeopleSoft application. 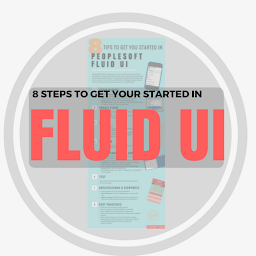 Fluid CheatSheet "8 Steps to Get Started in PeopleSoft Fluid"